Cilantro (leaves)and Coriander (seeds) and are names for different parts of the same plant, Coriandrum sativum, a naturally healing food in both forms. Cilantro is an excellent culinary herb that adds flavor to foods and improvse digestion. 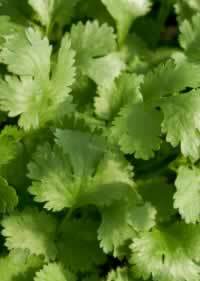 There are both scientific studies, and anecdotal evidence to support cilantro's reputation as a powerful depurative.. The herb may also have a protective effect when cooked and eaten with fish and other foods that may be contaminated with heavy metals. Preparation Methods & Dosage :The leaves of young cilantro plants, which resemble flat-leaved parsley, are staples in Mexican, Chinese and Thai cooking, as are the roots. 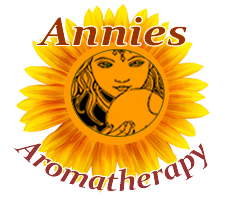 Flowers:shortly-stalked umbels, five to ten rays, pale mauve, almost white, delicately pretty. Sow directly in full sun after all danger of frost is past. Harvest seeds in late summer by cutting seed heads when ripe. Dry and store in glass jars. Coriander has been used by man since the dawn of history; the seeds have been found at neolithic archeological sites and in the tomb of the Egyptian pharaoh Tutankhamun. Cilantro is mentioned in papyrus scrolls and once grew in the famous hanging gardens of Babylon. The Hebrews used cilantro with other herbs in passover rituals. Hippocrates cultivated and used the herb in his practice in ancient Greece. 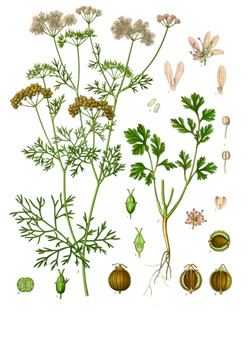 Cilantro made the voyage to the new world around 1670 and was planted in Massachusetts.
. Removal and preconcentration of inorganic and methyl mercury , Pubmed NIH PMID: 15721537, (2005): A sorbent prepared from the plant Coriandrum sativum, commonly known as coriander or Chinese parsley, was observed to remove inorganic (Hg2+) and methyl mercury (CH3Hg+) from aqueous solutions with good efficiency. Abascal K, Yarnell E . Cilantro culinary herb or miracle medicinal plant?, Altern Complement Ther. , (October 2012;18(5):259-26): Cilantro is purported to remove heavy metals, especially mercury, from the body; however, there is very little evidence to support this claim and much skepticism of its validity. Conversely, cilantro may reduce uptake of heavy metals if ingested during exposure and may protect the liver from some toxins. With increasing loads of heavy metals in foods, the authors suggest using cilantro especially when eating foods like fish, likely to contain mercury and other heavy metals.